A while ago when I posted about chocolate, Jacqueline and I got into a little discussion about chocolate and tea. She suggested that we do a little swap later this year, when her weather got cooler and before my weather heated up too much for the transportation of chocolate to be a bit dangerous. I have to say Jacqueline went way overboard with my package, I can’t say what is my favourite part of this package (I love it all) but one of my favourites is this. My very first tea-cosy, isn’t it cute? 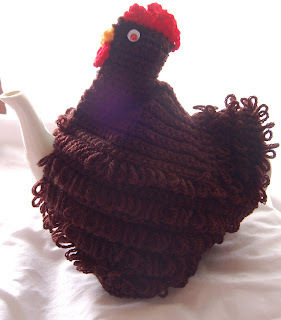 I have been saying for ages, I need to make a tea-cosy, either knitted or sewn and just never got around to it. Now I have my very own crocheted, lovely cosy. I am going to buy a new teapot for it, as mine is a little tall, I need a shorter , fatter pot, I think. 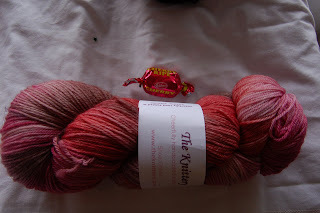 The package contained so many goodies, including some fabulous yarn from here, that hasn’t decided what it wants to be yet. 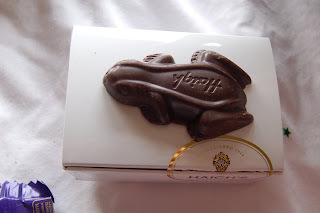 Some amazing chocolate, cadburys that I have never seen and some Haigh’s, including chocolate frogs and Bilbys. So thank you so very much Jacqueline, I love everything. I hope your box arrives soon. Well, I’m sitting here drinking my Melbourne Breakfast tea from T2, courtesy of Jacqueline, and there’s your post with more T2 tea. 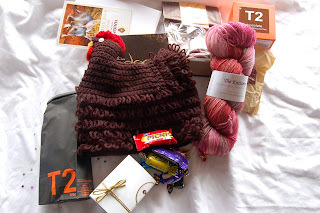 I must confess, I have been the lucky recipient of a Jacqueline package this week, too, and I’ve got my Knittery yarn and Haigh’s chocolates as well. She’s keeping us well spoilt!! I hope that you enjoy your package! i’m so glad you liked it all. i got your box yesterday and i hate to admit this but it is unlikely that there will be a photo of the chocolate on my blog. oh….you can only guess why some of the chocolate isn’t on my blog. ummm ermmm..it appears to have gone missing! And I love the skirt for the last post. Very lucky princess! That chocolate frog looks delicious. I have quite a craving for chocolate right now, and I have to say I’m disappointed I didn’t receive any Easter treats from my students. I used to enjoy making pyjamas and nightgowns for my children, using my own pattern. They were easy to make as they didn’t have to fit closely, just had to be somewhat loose and comfortable. I still have one pair of pjs I made for my son.